One of the things I love about living in Turin is enjoying the live music, whether it be jazz in Turin or other genres of music being played by talented musicians busking in the streets. One band I came across as I was strolling through the streets is Accordi Disaccordi . People always stop to listen to this swinging jazz band and their lively beats when they’re busking. And the crowds surely come when they perform at a live music venue. We are a trio. Two guitarists: Alessandro Di Virgilio, on lead guitar and Dario Berlucchi, on rhythm guitar. Plus, a double bassist. Now, we are alternating two different musicians on the double bass. Alessandro: I always wanted to be a musician…as a child I always listened to music and played it. I started studying by myself immediately, and as a boy I attended different schools and courses, up to the current jazz degree at the Conservatory of Turin. Dario: It’s the same for me, music is a passion that I’ve had as a child. As a teenager I started to play with several other projects, but I found in Accordi Disaccordi the project with which to grow professionally. We started as a band three years ago and hope it’s just the beginning! Alessandro: No doubt, in the 1930’s in Paris with Django Reinhardt, Stéphane Grappelli and others… I wanted to be one of the Quintette du Hot Club de France. Absolutely no doubt! Dario: Some time ago I would have said that I’d like to have lived in the 1960-’70’s (Woodstock era, Isle of Wight, etc.) but now I’d certainly choose to play with Alessandro in Paris. Maybe do a sextet with Django or in the early years of the New Orleans jazz scene. Also in New York, some years later. Do you have a time machine? Dario: In the past, many musicians have influenced me and my world, but I prefer to talk about the ones that I feel are important to me today. Surely Django Reinhardt (without which there would be no gypsy jazz), all jazz musicians (modern too) which gave me the opportunity to love this kind of music and, last but not least, my traveling companion Alessandro. Sharing so many types of music and musical experiences with him is very important and inspirational…for both of us. 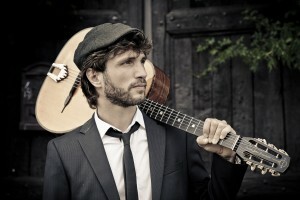 Alessandro: Django Reinhardt, for sure! 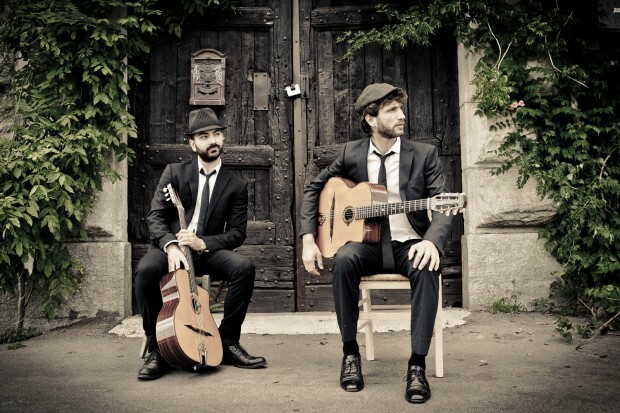 Biréli Lagrène, Angelo Debarre, Adrien Moignard, Gonzalo Bergara and their gypsy jazz mood… but also Wes Montgomery, Radiohead, Larry Carlton, Bebo Ferra, Steve Vai and their incredible art. All of them (and many more) inspired me! How would you describe your music; how is your music different from other bands out there? 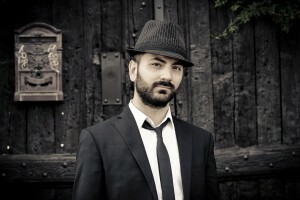 Dario: We usually call our music “hot Italian swing”: a mixture of gypsy jazz, jazz, swing and a little of revisited pop music, with particular attention to our Italian tradition and roots. Our music is based on a gypsy jazz repertoire, presenting typical national and international classics from the best of the 1930s’ music in a modern vein. Following the same gypsy style, we write our own music and rearrangements. Some of them are more modern and not strictly jazz, taking inspiration from the style of the popular guitarist Django Reinhardt. 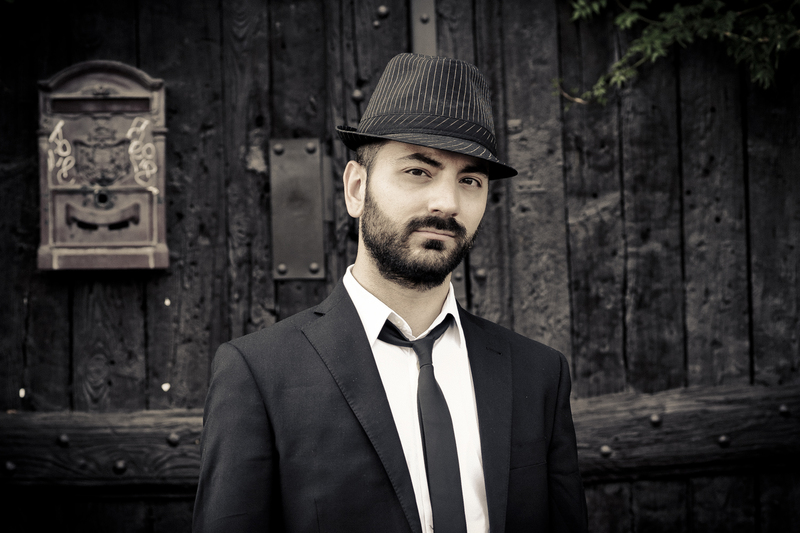 Alessandro: I agree with Dario: “Hot Italian Swing” is the best definition ever of our music. We are not a gypsy jazz band: we’re not gypsy (but we travel a lot) and we don’t play only manouche. We take inspiration from the manouche world but we always add a personal style in everything we do. We usually try to combine technical skills, standards with easy listening pleasure, even for non-experts. We can say we play pop(ular) gypsy jazz. Alessandro: Like spinach is for Popeye, we also have a special food to energize us. I’m speaking about our special “Spaghetti Killer”. The secret recipe is guarded by our Grandma Anna, our manager ad honorem, who usually cook it for us before and after every long tour. Dario: This summer, a journalist pointed out to us that we are the first band in the history of the Umbria Jazz Festival (an important international jazz festival which is held every summer in Perugia) that played free as buskers, along the roads of the city, and also in the main program, called by organizers: we are very proud of this! When you’re not performing, where can we find you. What do you like to do in your free time? Dario: I live in the Alps and I love nature and outdoor sports. The view from the mountains helps me to relax and reconcile with the world, especially after a long tour. Alessandro: Surely at a concert! I love to study music, even in my free time and every gig is a good moment for me to relax and do this. Dario: We started playing 3 years ago here, in Turin, along the roads of the city centre: we’ve always loved playing our music beside Baroque buildings, Art Noveau architecture and in the middle of historical squares. We are part of the local manouche scene and there are other groups playing very good gipsy jazz. 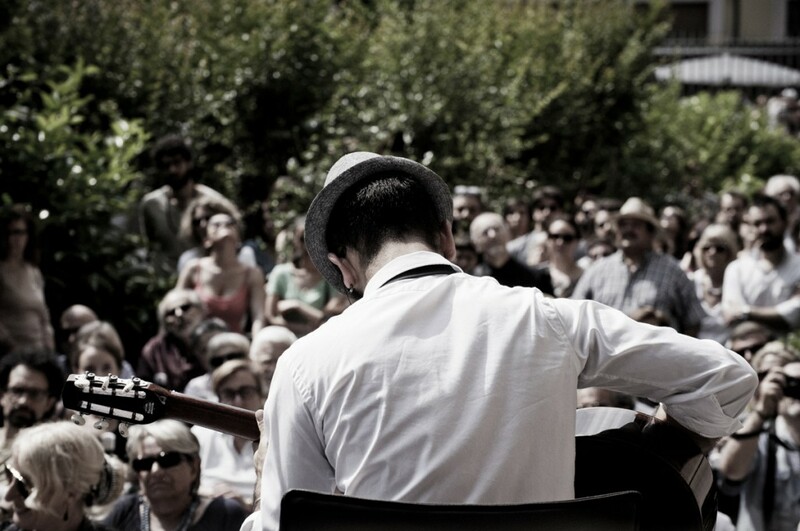 We organized the Manouche four day show in Turin, with other friends and with the Associazione Jazz Manouche (http://www.djangoreinhardt.it/), during Torino Jazz Festival 2015. It was a good opportunity to see some local musicians “at work”, as well as international guests like Adrien Moignard, Matt Holborn and Giacomo Smith and to realize that Turin can offer very good and original gipsy jazz (and obviously jazz) music. Dario and Alessandro: “Listen, study, play and travel” is our mantra. Our best advice is contained in these 4 words. 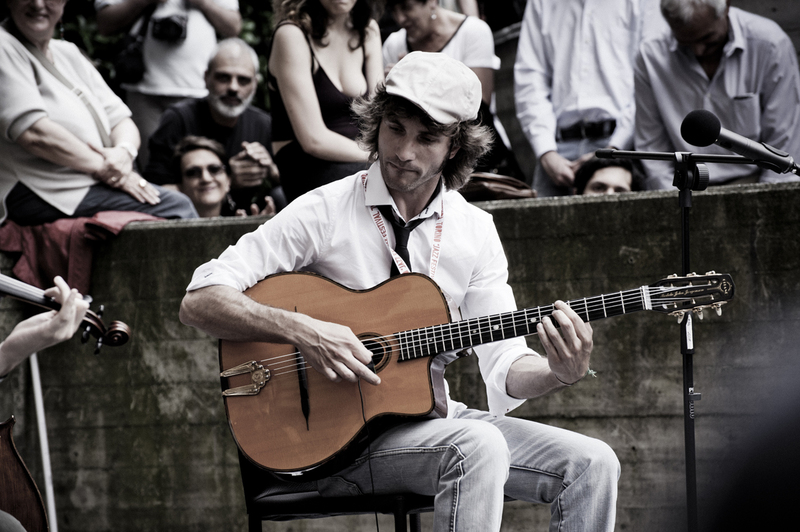 For more jazz in Turin, come during the Torino Jazz Festival, which takes place annually in either April or early May.